You have heard of Guantanamo, you have heard of Abu Ghraib. I’ll share with you, my experience more sinister than these. Incarcerated in a shaking dark chamber, where one could barely wriggle; I was made to survive for months on just fluids. A tube was thrust inside my body and they gave me, what they wanted, just through it. I kicked, I punched and then I just waited helplessly. Finally, today I got free; I got born. Continuing with the set tradition on this blog, this is a 77-Fiction on the occasion of my 77th post. No prizes for guessing, what possibly it can be dedicated to! 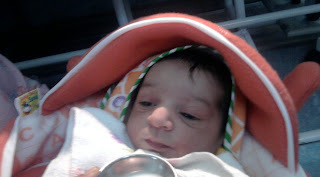 Presenting to you my lovely niece Nirbhita, who joined us today at 1538 hours. I was the first amongst the impatiently waiting people to hear her first cries as she got free from her Guantanamo. And the best part is that, today happens to be my sister aka her mother's birthday too. Click here to see her other pictures. WOW !!! Congratz ...for being Mama ...Lots of Good Wishes for the Little one...and You have kept the tradition alive of 55, 66, 77 and What a way to celebrate...GR8!!! Allright. Inspite of commenting in your FB status, I tell again. Congrats mamu. It gives me nice feeling to call you mamu. Today is a very auspicious day.You have two occasions at home.Mother and child celebrating on the same day. I wish her a very long,healthy and meaningful successful life. Vipul,you have missing for some time...without your comments,posts are dull. Thnx Bharathi.. celebrations like these r completed by frnds like u..
how do u guys address maternal uncle in tamil?? "It might not be exactly like brochures in heaven had said :P ... but its all urs to have "
Chowlaji, thnx a lot.. Its an auspicious day for us indeed.. a lakshmi cuming our home jus b4 diwali..
Wow! CONGRATULATIONS to you too! This is also used in another situation. close friends address themselves calling mamu or mams. Cute baby! Blessings to her and congrats to the family. You have a great blog bro. Keep it up! All the best! Congrats on both the 77th post and on the occasion of becoming a Mama! Then.. I am yet to discover my problem... ha..ha.. only one party for two gifts...thats funny..
Vipul, congrats! So when planning to throw a big party for all of us!! I loved those Post script! What a way man! You are Awesome and I mean it! Gud to hav a grover bro amongst the readers. U don't hav ur own blog right?? wow.. mom and the daughter share the same bday..
so mama finally.. unfortunately mama has another meaning in tamil..i feel u can ask the person whom u want to call mamu itself the other meaning..
n wat does the name nirbhita mean?? Today seems to be my birthday too :-) Good News! Nope, I don't have a blog. Maybe I will someday. Can't we have some more pics of the cutest baby in the whole world? Pretty please? Yeah sure Ramit, will be uploading thm soon on Fb.. will leave a link here..
Hey Bharathi mamu, what is this other meaning, Vishnu is telking about?? @ Shruti: wasnt I right. @ Vishnu and Vipul: Dont listen to Vishnu. he is a dirty guy. I want to teach you all the good words and it seems he will not let me do that(jus kidding). The other dirty meaning for Mama is pimp. And for some reasons, they call police as Mama too. Better you call Vishnu as mama too so that he woudnt remind you of all these dirty meanings. And now it seems your announcements worked and you got over thirty comments. Please share your medication with me too as I got only 14 for my latest post. @vipul.. there u hav it.. ur mama gave the perfect explanantion.. lol..
@bharathi.. wen u r learning a new language from friends.. the first thing they will teach u are the non-parliamentary words..
Great news!! congrats!!! now you have someone to play with :) Have fun! Congratz mate ! Happy welcome to the new bundle of joy in your family ! Having said it, I would strongly disapprove your comparison of womb with Guantanamo. About the guantanamo-womb comparison, I hd been waiting 4 sum1 2 raise this point.. I agree with u tht both can not b compared bt this was jus my interpretation of a newly born's perspective..
happy birthday to neha and nirbhita!! Hey thnx Tangerine.. Happy Festive Season to you too. But referring to a mother's womb as more sinister than Guantanamo and Abu Ghraib (?!!)... I ask you! P.S. Wish you a very happy, safe and prosperous Deepavali/Kali Puja... !!! May the festival of lights bring lots of happiness and colour into your life and a New Year blessed with prosperity! Read your previous posts too. Really enjoyed the story man, well done. Thanks for all your support and comments at the RCB blog :). Voted for you at the indiblogger :). Hi, Prashant.. Hard luck man.. It was my pleasure supporting u guys at RCB blog..
Ummm, I guess most folks commit some sort of "galti se mistake"... so chill... !!!! Might post sumthing b4 tht too.. who knows! !